There are many great events in the Twin Cities for practitioners interested in international nongovernmental work! We try to keep up on these events and post them here. On this page, you will also find MINN-hosted events. If there is an event that you would like to see posted here, please fill out this form. With co-sponsorship, MINN can help promote or put on an event! Get answers about the different kinds of co-sponsorship, what they involve, and their benefits here. For the past 22 years, Mano a Mano has been collecting and shipping millions of pounds of surplus medical supplies from hospitals, clinics, and other organizations across Minnesota and the Midwest to Bolivia where the supplies are distributed to people and organizations in need throughout the country. 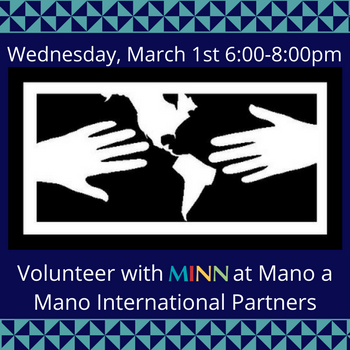 Join MINN on Wednesday, March 1st for a group volunteer opportunity at Mano A Mano (925 W Pierce Butler Route, St Paul, MN 55104). Sort medical supplies to be shipped, learn more about a locally based international NGO, and network with MINN community members!